Fred C. Kelly (1882-1959) was an “amateur psychologist”, writer, traveler, columnist, and even a special agent for the FBI. Kelly went on to be the official biographer of the Wright Brothers (1943). In addition, Kelly was a trader and active market participant in the late 1920’s. If you enjoy reading about investor-trader behavior, psychology, and are a student of market history, you will enjoy this book. You should add Why You Win Or Lose to your “Classics” library as it is short (70 pages) and inexpensive ($4.50). You can find it on Amazon [HERE]. I appreciated that Ian. Thanks for making us aware of the book. 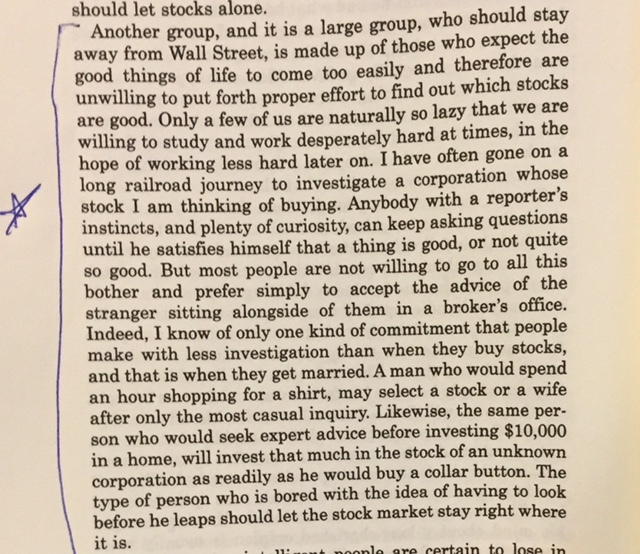 The role of an investor’s or a trader’s psychology in determining ultimate success or failure (or mediocrity) is dominant assuming an investor is willing to put the time into doing the research. I learn that lesson over and over. What actually works in the market is pretty clear by reading a few books, but what do you do if your stock is down 50%. Or up 50% for that matter. I’ve known investors who are highly successful who react completely differently from each other, but never known anyone who makes it up as they go along and who survives at this. You need principles and a structural framework to help you make decisions at crucial junctures. I recall Howard Marks’ thoughts on the market that you brought to our attention — just because the market is doing something that seems to defy explanation doesn’t mean that it knows something that you don’t. The market, he said, is no smarter and knows no more than the average participant, implying I think that in his mind the average participant is not all that informed or intelligent. Or in the know. Hmmm. I think that investors with a lot of money have a disproportionate influence on security values, and that in general they tend to be more informed and intelligent than the average investor. Still, there are two primary influences on stock prices. (1) facts and (2) emotion. It is like in sailing, the primary factors are the weather and the skill of the sailor. If a security moves dramatically in one direction or other the crucial question is was the move due to facts or emotion. If facts, an investor should often do something — sell or buy more. If emotion, and the security falls, buy more. So it boils down to how much an investor actually knows about a situation, how much he or she thinks they know and the ability of the investor to control their own emotion. I’ve watched over the last couple of years your comments on WFCF and admired your patience and conviction. I don’t care what anyone says, that’s not easy. Investing in a stock with huge potential but trading at a premium to underlying value, requires faith that the subsequent growth will be sufficient to overcome the deficit, plus some. That’s a valid approach in my view — in general companies with the best prospects tend to trade at a premium — but when that growth falters the decline can be significant. Analytical ability becomes crucial and you work hard at truly understanding a company. I put that time into looking at hundreds of companies in a much more cursory way. An interesting factor that I’ve encountered — when you study the 100 companies with the most significant growth over the last two years in revenues, earnings, margins, book value, return on capital and free cash flow, there is a major discrepancy between the average current stock price and the median value as indicated by earnings and free cash flow with values ranging from 10% of indicated value to several hundred percent of indicated value to infinite (companies that have no value based on current earnings). The question again gets largely back to Howard Marks’ observation — who knows more, you or the market. If the discount to underlying value is due to emotion, or at least not due to a problem or threat not widely appreciated, very significant amounts of money can be made. The most difficult and important thing I’ve learned making and losing money as an investor is that extraordinary returns are generally made because security prices are more volatile than the actual underlying companies . That discrepancy is largely due to emotion and the related attempt to predict the unpredictable, and that that discrepancy is either an investor’s best friend or worst enemy. Fortunes are made and lost as a result of that discrepancy, as a result of emotion, both that of the investor, and that of the market in total. More than anything else other than perhaps hard work and careful thought, ab strategy needs to fit an investor’s strategy needs to be based on individual strengths and weaknesses as a human being. A crucial consideration that affects all this that I seldom see discussed — what is your time frame — making money in a week, a year or in ten years. That too has to fit your personality and your ability as a human being to be patient. What do you do if a stock you are in falls significantly? As an investor, I think you need to know the answer to that before you make the investment, not make it up as you go along. Sell or buy more are equally valid, but can’t be based on emotion if you are to survive at this. I can’t add much to this Rod. I agree. I just reread what I wrote and noticed my poor proofreading. More importantly, I should have added something about interplay. If you know a lot about a few companies, you are better off being non-diversified, say five holdings or less. If a few crucial facts about a lot of companies, diversification works better. And if you know a lot about a few companies, buying on weakness works. If you know a few crucial facts about a lot of companies, but not all crucial facts, selling your weak investments and redeploying into your strongest performers may make more sense. After experimenting, because I invest in high growth, low debt companies, which tend to be volatile, and I know more than a few crucial facts but not as much as Ian does about his investments, I’ve settled on selling no more than once a quarter. I sometimes incur sharp painful short term losses, and am sorely tempted to cry UNCLE as I look at the quarter’s end way way off in the distance like a mirage, but I stick with losers at least until the quarter’s end. I’ve lost more money from selling good companies too fast than too slow. Much, much more. And I increasingly see the value in Ian’s approach — ie contacting senior management, directors and major shareholders to learn more about competitive advantage prior to taking a position. Not only do I learn a lot but find I enjoy the exchange of information. They tend to be intelligent accomplished people. But my real point is that the interplay of factors – the relationship between the elements of an investor’s strategy — is more important than whether an investor or trader is long term or short term or knows a lot or a little about the companies invested in. I write at length mostly because I learn by putting my thoughts down — somehow discover who and what I am as an investor often in response to others’ posts. I get comfort knowing that only those who are interested read this stuff I throw out there, and that some must read it irritated by my lack of brevity.